CAIs. Calcium aluminum inclusions. What’s so special about them and why do we talk about them so much? 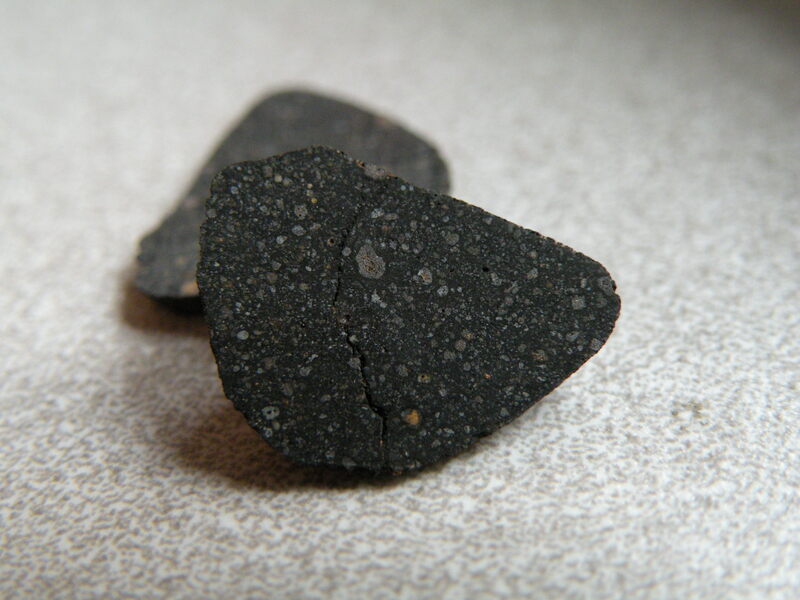 Well, many people talk about chondrites being “four and a half billion years old.” And you wouldn’t be wrong if you said that. But, when you look more closely, things get a little more interesting. We don’t know exactly how chondrules and CAIs formed, but the abundances of the isotopes they contain tell us that they didn’t form in quite the same ways. CAIs more often show large variations in their ratios of particular isotopes. We observe isotope fractionation on Earth; it generally relies upon one simple principle: lighter atoms are easier to move than heavier atoms. The classic example: rain. Water is H2O. Two hydrogen atoms and one oxygen atom. But not all oxygen is the same. The top left number is the number of protons plus the number of neutrons in each atom. All oxygen atoms have 8 protons. That’s what determines how many electrons they have, which is what makes them act like oxygen, chemically. In addition to those 8 protons, oxygen-16 has 8 neutrons in its nucleus, oxygen-17 has 9 neutrons, and oxygen-18 has 10 neutrons (it’s just addition). Neutrons add mass to atoms, but they aren’t charged particles, so they don’t change the structure of atoms’ electron shells. In other words, they add mass, but don’t change how atoms interact with other atoms in a large way. Let’s pay closer attention to three numbers in the above image: 15.9949, 16.9991, and 17.9991. Without getting too bogged down in the details. If you had 15.9949 pounds of 16O, the same number of atoms of 17O would weigh 16.9991 pounds, because you’d have an extra pound of neutrons. The same number of 18O atoms would weigh ~another pound. Why is this important? If you think about different liquids — things like alcohol, water, engine coolant, or anything else — they all have different boiling points. Engine coolant won’t boil until it gets really hot (up to ~356°F or so), water boils at 212°F, and alcohol boils at ~173°F. These differences in boiling point usually relate directly to the masses of the molecules involved. It usually takes more heat energy to separate larger molecules. Now, 16O is too close to 18O to have a measurably different boiling point, but when water evaporates, it is a little easier for the water with 16O to evaporate, because those atoms are a little lighter. What’s going on here? Just make a note of the ∂18O values. What do they mean? Well, we use the ratio of oxygen isotopes (16, 17, and 18) in global ocean water as a standard, so the value of ocean water is 0%0 for all three isotopes, by definition. Water vapor in clouds over the ocean is -12%0 per the above image. So…it has less 18O in it than ocean water, by 12 parts per million (denoted by %0). The first rain to fall is relatively enriched in 18O, because the heavy water likes dropping out (it’s heavy, after all). The resulting rain still has less 18O than ocean water, because the clouds had so little to begin with, but that rain is much more enriched in heavy water than the vapor that’s left behind. This keeps taking heavy oxygen out of the clouds, until they have a ∂18O value of -17%0 by the time they get inland. 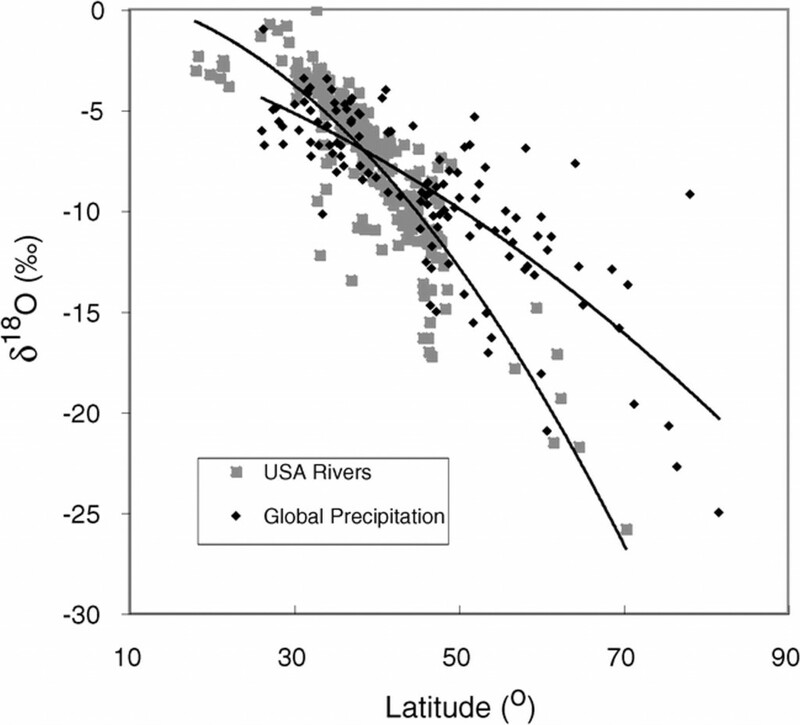 Note that water gets lighter at greater distances from the equator. This is because ocean evaporation occurs much more rapidly in warmer climates, closer to the equator. These kinds of reactions don’t just happen with water, though. They’re happening all around you. Plants concentrate light carbon isotopes because it’s easier for them to move lighter atoms around. Even your body is in on it: the nitrogen isotopic signature of herbivores is lighter than that of the plants they eat. Carnivores have even lighter nitrogen. This is because lighter nitrogen isotopes are easier to move around in metabolic processes. It’s the same principle as with O and C.
If you took a bunch of really hot gas with the composition of the sun and you started to cool it, aluminum and calcium would be two of the first elements to condense — and then the first elements to solidify after things cooled down a bit more. We’ve dated CAIs; we know that they’re some of the earliest solid objects to condense in the solar system, at ~4.567 billion years old. So, the thermodynamic models and radiogenic dates support each other. That’s nice. The type specimen of a new CM2 from Northwest Africa. The white-colored inclusions are tiny CAIs. But why is this important? Well, if CAIs were the first solids to condense, they might preserve some traces of the conditions in the solar nebula from a time before most other things had formed. And we see some interesting isotopic trends in CAIs: some of them are seriously enriched in heavy isotopes, suggesting that they were exposed to heat capable of evaporating some of their (lighter) calcium and aluminum atoms. It’s just like we see on Earth, with water….but it was happening in space, over 4.5 billion years ago. But it’s not all so simple; some CAIs are messy. Some of the isotopic ratios we see suggest that these little globs of rock were exposed to widely fluctuating temperatures that were causing them to evaporate at ~2,000+ °C, and condense — perhaps repeatedly. It’s hard to tell how many heating events there might have been, but ongoing work on chondrules suggests that these events were likely repetitive or cyclical in nature. So, while most CAIs have pretty simple isotopic signatures suggesting that they cooled right out of a gas, we know that the early solar system wasn’t such a simple place everywhere. In places, at least, these little globs of rock were forming and then being evaporated and re-condensed. And there was definitely sorting going on; chemically different meteorites have different amounts of CAIs, in different average sizes and slightly different compositions. In short, CAIs are some of the earliest solids we have examples of, and they have preserved a thermal record of the earliest days of our solar system. But rocks are messy, there are a lot of isotopes, many of them are hard to measure precisely, and it’s hard to sort out exactly what they’re all telling us — that’s where research is ongoing. This is why CAIs are cool.